Children are instinctively drawn to nature – it relaxes and inspires them. Admire stunning displays of color, from pink cherry blossoms to yellow, red and orange fields of tulips. Take a walk on winding paths past ponds, bridges and sculptures as you listen to the songs of birds and take in the scents around you. Several of the parks on our list are world-famous, while others are smaller, with unique designs and layouts. These family-friendly gardens offer spaces and activities designed for children where younger visitors can learn about plants, insects and energy conservation. The Brooklyn Botanic Garden in New York is home to one of the most visited Japanese-inspired gardens in North America, complete with winding paths, wooden bridges, stone lanterns, a pond, a waterfall, an island and a Shinto shrine. Everyone interested in planting their own garden should visit the Herb Garden which will teach you practical gardening techniques. 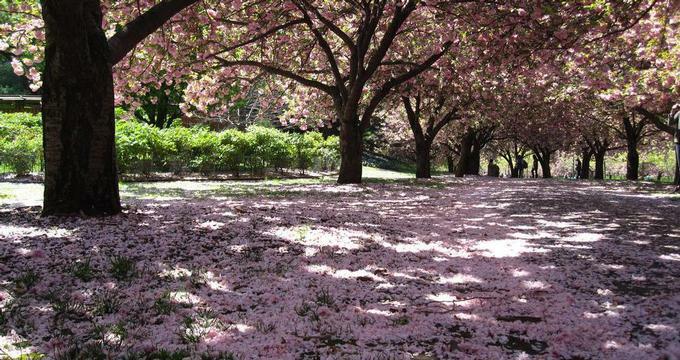 From mid- to late-April, you can watch the colorful flowering cherry trees on your weekend getaway. 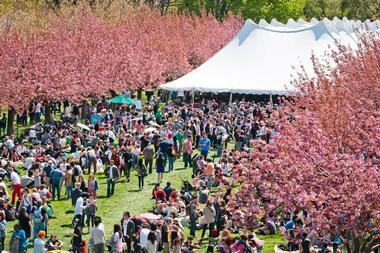 The Cherry Esplanade lawn is a beautiful spot for a summer family picnic. 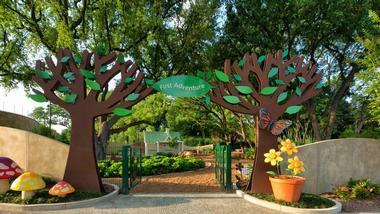 Children’s Garden offers educational programs for children ages 2 to 17. Pick up a copy of the Kids’ Discovery Guide which has tips and ideas for family visitors. The new Discovery Garden is currently under construction and will feature interactive exhibits, animal life and exploration for kids. Lily Pool Terrace is a beautiful spot where you can see 100 water-lilies, lotuses, fountains and birds. More ideas: 25 Best Things To Do in Brooklyn. The Rory Meyers Children’s Adventure Garden, set on 8 scenic acres overlooking the picturesque White Rock Lake, features over 150 activities for children. The garden is designed to be both educational and fun, letting children learn about plants, insects and nature while engaging in hands-on activities. There is a water play area, a giant kaleidoscope, petroglyphs, a roped area above the ground, a touch tank, plant petting zoo, a unique solar tree and many other incredible exhibits. The Children's Adventure Garden Café serves family favorites, including salads, sandwiches, pasta and desserts. More vacation ideas: 23 Best Things to Do in Dallas. Longwood Gardens in Kennett Square, Pennsylvania are home to thousands of stunning orchids, unique fountains and the 86-acre ecological Meadow Garden. Visitors can go on guided tours, participate in family-friendly activities and attend music performances. The East Conservatory is a flower-filled space under a half acre of glass, complete with waterfalls, pools, and fountains. 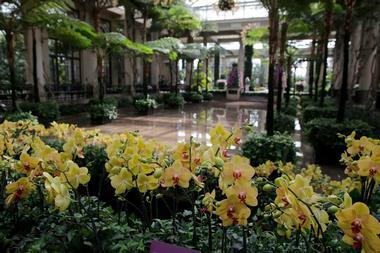 There are 7,500 orchids at Longwood Gardens, 500 of which are on display year-round at the Orchid House. The Atlanta Botanical Garden is home to stunning indoor and outdoor collections where visitors can admire orchids, tropical plants and animals such as poison arrow frogs, geckos and tortoises. The Desert House contains plants and animals native to Madagascar. Outdoors, you will find the Edible Garden, Rose Garden, the Hydrangea Collection, the Dwarf and Rare Conifer Garden, the hardy palm collection, cobra lilies, water plants and much more. More vacation ideas: 23 Best Things to Do in Atlanta. 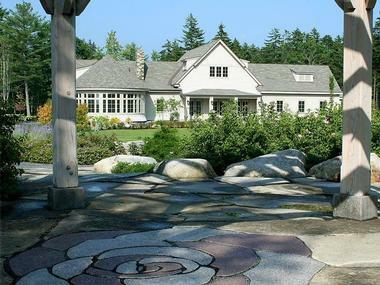 Coastal Maine Botanical Gardens in northern New England are set on 270 acres of land. You can check which plants are in bloom and create your own custom tour online before your visit. There is plenty of unique art in the gardens, both permanent and seasonal. 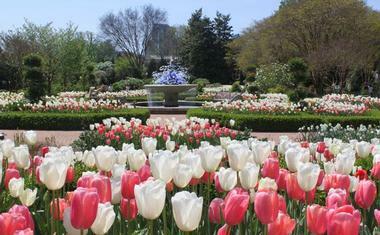 If you love roses, head to the Rose & Perennial Garden. 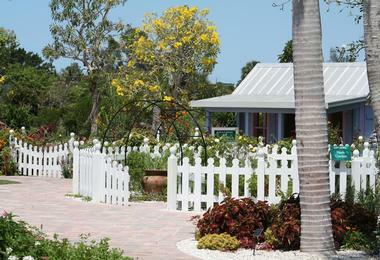 Bibby and Harold Alfond Children’s Garden has a pond, Storytime on Mondays, and gardening programs for kids. The Glasshouse at the Cleveland Botanical Garden houses 350 species of exotic plants and a variety of butterflies, reptiles and birds. 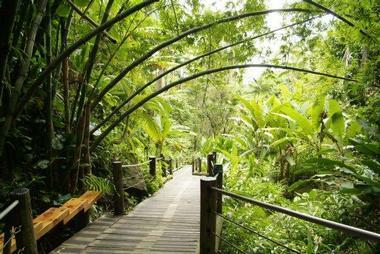 Experience what it feels like to walk through a rainforest of Costa Rica or a desert garden in Madagascar. Guren Art Gallery exhibits works of art inspired by the natural world. 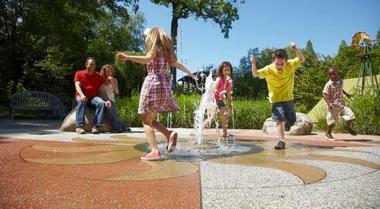 Kids can play in Hershey Children's Garden which has a giant tree house, fountains and plants. Have lunch at the Garden Café which serves sandwiches, chili, soups, salads and pastries. Located on the scenic Hamakua Coast on the Big Island, Hawaii Tropical Botanical Garden has a collection of over 2,000 species of plants. The garden is set in a lush 40-acre valley with fertile volcanic soil, a tropical rainforest, streams and waterfalls. Let your children experience what it feels like to walk through a tropical garden, complete with nearly 200 species of palms, colorful geckos, birds and other wildlife. The whole family will enjoy stunning views of Onomea Bay as you walk along the garden trails. The Huntsville Botanical Garden has a two-acre Children's Garden made up of eight separate gardens. 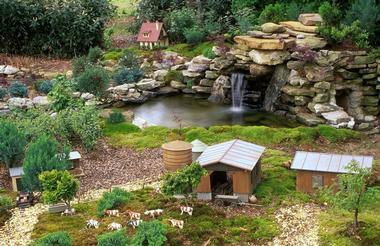 The Storybook Garden has a pergola, wishing well, a hidden garden gate and references to popular fairy tales. The Bamboo Garden lets children learn all about the fast-growing bamboo and the objects that can be made from it, including cutting boards, musical instruments, fishing poles and bridges. The Children's Garden is also home to a real Space Station node, wading pool, kaleidoscopes, labyrinth and a tree-house. 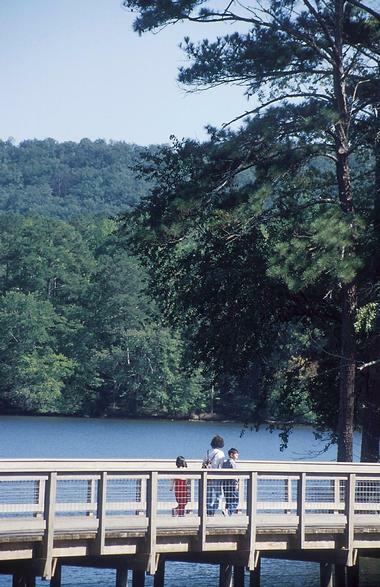 More vacation ideas: Best Things to Do in Huntsville, Alabama with Kids. The Children's Garden at the Naples Botanical Garden features many unique spaces, including the Hidden Garden where you can see flowers growing from shoes, Judy Herb's Herb Garden and the interactive Vicki Oppenheimer Healthy Eating Garden. Observe native Florida plants, play on the beach with toys, build castles and admire butterflies in the Pfeffer-Beach Butterfly House. Walk past the waterfall, cave, tree house and the climbable fire tower. Children can plant seeds, water plants and play in the fountain. The Naples Botanical Gardens also features Asian, Brazilian, Caribbean, Florida and Water Gardens, as well as a 90-acre preserve which is home to 300 species of native plants. More ideas: 50 Best Florida Weekend Getaways. Callaway Gardens in Pine Mountain, GA is a 2,500-acre complex with lakes, golf, several accommodations and many incredible gardens. The John A. Sibley Horticultural Center is a five-acre greenhouse and garden complex featuring tropical and sub-Mediterranean plants, sculptures, a grotto, 22-foot indoor waterfall and an outdoor garden. The 40-acre Callaway Brothers Azalea Bowl is home to 3,000 hybrid azaleas. Families can visit the Pioneer Log Cabin, Day Butterfly Center which houses 1,000 butterflies, and observe wildlife such as ducks, birds, hummingbirds, fox squirrels and water turtles. You may also like: Best Science Museums & Planetariums.